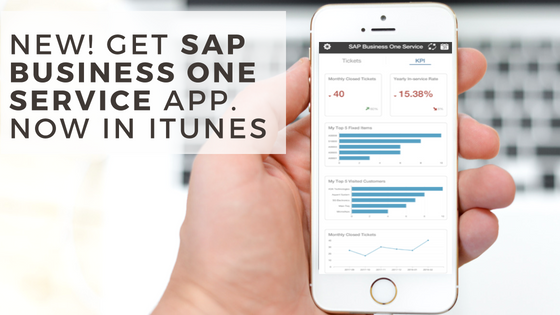 It’s finally available: SAP has released the highly anticipated SAP Business One Service mobile app for the Apple iOS. With this new app, your Service team is now able to quickly review and resolve service tickets anytime, anywhere. View Key Performance Indicators (KPIs) on-the-go, and more! Check out the video below to see how the new SAP Business One Service mobile app works. This new addition brings SAP Business One’s official mobile app portfolio to a total of three – the original SAP Business One mobile app for finance and business users, the SAP Business One Sales mobile app for busy sales professionals, and now the SAP Business One Service app for service technicians to keep customers happy, always. Why is the New SAP Business One Service App So Desirable? SAP Business One partners like us have been expecting something like this from SAP for a while, and SAP finally announced it – along with other SAP Business One updates, during the SAP Innovation Summit earlier this year. It’s a benefit many SAP Business One customers want, and this new app shows SAP has been paying close attention to their SME customer base. Your service staff can even work offline with the SAP Business One Service mobile app. If it’s going to be difficult to access the Internet at a customer’s site (especially at rural areas), your service technician simply needs to download the service ticket data ahead of time. They can then work on resolving and closing the tickets offline at the customer’s site. Once your employee has access to the Internet again, he or she can easily upload the latest service ticket data in the app without any data loss. The new SAP Business One Service mobile app is a great and much-needed addition to the ERP system’s mobile offerings. Not only can service technicians easily manage their daily workload on-the-go, they can also help maximise their customer interactions, thanks to accurate real-time information. If you’re interested to give the SAP Business One Service mobile app a go, simply head to the Apple store to give it a try. However, do note that you’ll need to have SAP Business One 9.3 or higher, and use SAP HANA as your database engine in order to use this app.